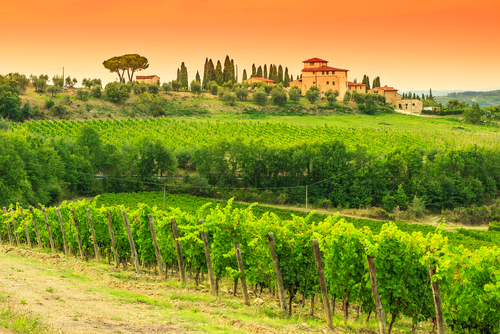 Getting from Florence to Chianti isn’t difficult — and seeing the countryside there is “a must” when you’re visiting Italy. Even after I lived in Florence for five years I couldn’t get enough of it, it’s that beautiful and unique. And even if you think you’ve seen enough of it in movies, know that there’s nothing like being there in person. There’s also nothing like drinking Italian wine from a wine tasting room at the vineyard where it was made. Figuring out the best way to do this depends a lot on how comfortable you are with adventure. Although Tuscany is a very modern place, many places in Chianti are remote because of their locations high on isolated hilltops. That means that it often takes more strategy to get to them. Still, it’s absolutely worth the effort. Even the best photos can’t compare to the feeling you get when you’re really there. The three main choices are bus, train, and rental car—and there are definite pros and cons to each. You can also hire a taxi, but I’ve never done it and can’t recommend it. I’ve outlined below what you can expect from these options, so you can make the best choice for you. Many buses go from Florence to Chianti. If you choose this means of transportation, for the sake of ease you may want to limit yourself to going from Florence to San Gimignano. It’s a beautiful hill town that is very easy on tourists who don’t speak Italian. By taking the bus there you can get a good sense of the Chianti countryside, but you won’t be able to meander through it. When I first went to Italy during my junior year in college, I took a bus to San Gimignano from Florence and was satisfied with making this one stop, plus getting the view outside the bus window. In addition, there are buses that go from Florence to Volterra (where a scene in Twilight was filmed), Gaiole in Chianti, and Radda in Chianti. Within Chianti there are also local SITA, LAZZI or CAP, and ATAF buses that make stops at small towns. It can be hard to understand which bus you should take and even how much to pay. If you’re going to try and piece trips together like this, I suggests you ask a local Tuscan for advice—for instance, someone at the hotel where you’re staying. Another option is you can go from Florence straight to Siena by bus, enabling you to see Chianti without getting out. The cost of a bus from Florence to Siena can be about 3 Euros each way. It takes either 1 hour and 15 minutes (on the rapid line), or 1 hour and 35 minutes (on the ordinary line). In Florence you can get a SITA Bus (or the Tiemme Spa bus), which originates at the Via Santa Caterina da Siena 15, near the Santa Maria Novella train station. In Siena the bus station isn’t far from the town center. For other local CAP buses that travel within Chianti, try the Lazzi site which I’ve linked to here. It’s in Italian, but you can have Google translate it for you. You can also take a SITA bus from Florence to Greve in Chianti, one of the bigger towns, or from Florence to San Paolo in Chianti, in the hills. The Florence city ATAF bus number 49 goes there, too. You can buy a ticket at local tobacco shops called tabacchi; you can identify them by a large white “T” on the outside near their door. You can also buy tickets on board the bus, as long as you’re willing to pay an extra, small fee for the service. Keep in mind that the bus driver may not have the exact ticket you want or even the right amount of change. So you may end up spending more than you plan. Also, don’t forget to validate your ticket as soon as you board; you do so using the ticket machine located behind the driver. One big drawback to taking buses is that they generally don’t run after 7 or 8 p.m., or for long stretches during the day. Weekday timetables differ greatly from weekends. In other words, expect to sit around waiting! The train from Florence to Siena is an easy and fast way to get a look at Chianti without actually stopping in it. In Florence you board the train at the Santa Maria Novella station in the center of town (you can walk there from the Duomo). By taking the train you will not partake in the true Chianti experience—no vineyard wine tastings, no stops at small trattorie in fortified villages for lunch. The cost of the train ride is about 9 Euros, and takes about 1 hour and 30 or 45 minutes. It’s quite a walk from the Siena train station to the center of town, but there are local buses that go between them. If you buy a train ticket remember to validate it in the ticket machine located in the train station. Check near the entrance to the station; in Florence one machine is just inside the main doors. When you rent a car the best Chianti adventure opens up before you! You can go anywhere and do anything. If you see a distant hill town that intrigues you, but isn’t on your itinerary, you can make an easy side trip to see it. (Bear in mind that in this hilly area what appears to be close can actually be quite far away.) You can stop for ice cream or a meal to sample the best Italian food dishes, and you can take photos from every peak. This is, as you’ve probably guessed, my favorite way to visit Chianti—but it comes with some caveats. The three big drawbacks to driving through Chianti are: the traffic, the time it takes, and the often confusing roads. When my family and I rented a car and drove from Rome to Chianti in 2015, on our way to Florence, I was reminded of just how confusing it can be. I’m fluent in Italian and still we found ourselves missing exits and getting lost on bumpy, winding country roads. It was so much fun, but we were tired and grouchy by the time we got to our hotel. I have driven in many major cities (from Boston and New York, to Italy, Germany, and Turkey), and I don’t find Italian traffic particularly intimidating. Most Italian drivers are very good at it and take it very seriously. I don’t think the myth that Italians are “crazy drivers” should intimidate you from trying. The Italian highways are generally in very good condition and are easy to follow. That said, I can’t emphasize enough that the roads between villages are sometimes poorly marked and country roads can be full of ruts and bumps. If you’re comfortable getting lost and asking for directions, you’ll love the experience. If doing this type of adventuring at home makes you uncomfortable, I suspect your discomfort will only be heightened while abroad. 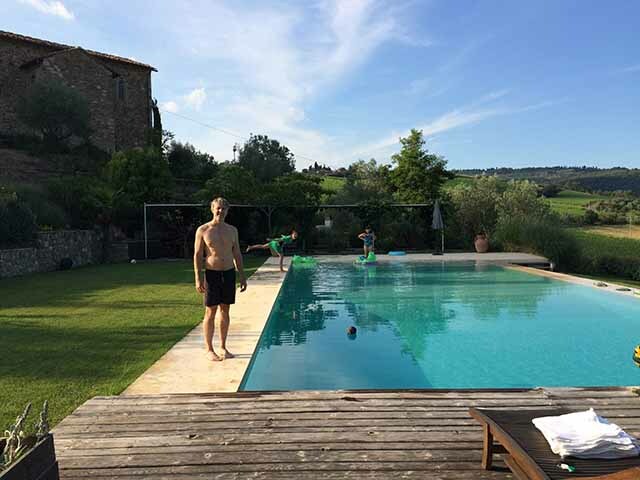 The flip side is that the hotel where we stayed in Chianti, Villa Rignana, was located on a working farm overlooking acres of vineyards! As we bathed in a saltwater swimming pool at the top of the hill, staring out at the sunset, all the stress of driving faded instantly away. Had we taken the bus or train, we never could’ve gotten to that spot. I’ve found that the easiest way to rent a car in Italy (and the rest of Europe) is online via one of the American car rental agencies. During our most recent trip we opted for Hertz and found there were abundant drop off and pick up locations in convenient places. The offices were well staffed and the overall process was easy. We didn’t opt for the GPS, which was expensive, but there were moments when we wished we’d had since the GPS on our phones wasn’t working. To get information on Hertz and other agenices, you can go to the Travelocity car rental page and compare prices. Know that renting a car there isn’t cheap: We spent almost $300 for two days, but it was well worth it. 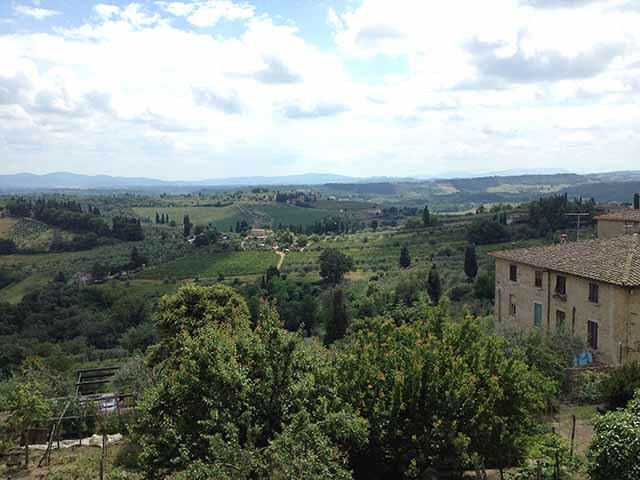 Do you have questions about traveling from Florence to Chianti? Please leave them in a comment and I’ll try to answer them. 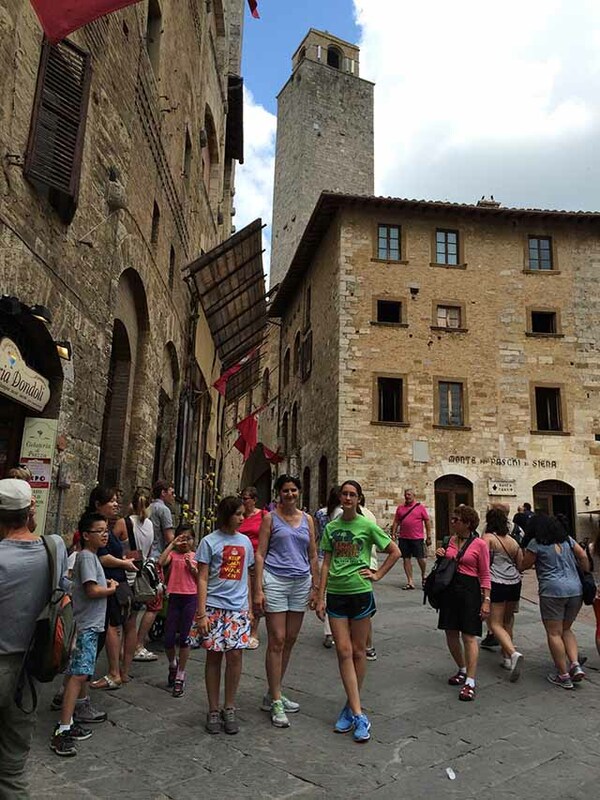 My family is traveling to Florence June 9 and 10. We would like to rent a diver to take us to Greve and Montefioralle, Italy and to a winery close by. Do you know any services that i could contact or private drivers? There are 5 of us.